Danny Cook from Romford in Essex rode his first Festival winner when Great Endeavour won the Byrne Group Plate for trainer David Pipe. Pipe was welcoming his second winner of the day following Buena Vista’s success in the Pertemps Final - the double paid 322-1. Cook, a conditional jockey who claims a 3lb allowance and works at Pipe’s yard, scored in the colours of owner David Johnson, who was also represented by Chapoturgeon (7th) and Our Vic (14th). 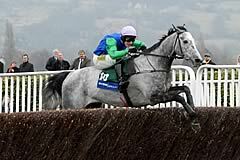 Cook said: “He jumped and travelled so well I was just a passenger. I had him in the right positions and when he made his mind up he wanted to go on I didn’t want to disappoint him. “He’s always been a well-balanced horse and his jumping was very good. It’s been very nice of Mr Johnson and David to give me such good rides. The horses have to be well trained at home and ready for this experience on the racetrack so it’s all down to the whole team at Pond House. Pipe said: “Danny’s given him a great ride - he won on him at Towcester and is very good for his 3lb claim. They went a good gallop and I was little concerned about the trip because he does stay further, but it’s another Festival winner for the yard. FROM DAWN TO DUSK ONE MISTAKE AWAY? From Dawn To Dusk almost supplied trainer Philip Hobbs with his third victory at this year’s Festival. After making a bad mistake, he recovered to finish third to Great Endeavour in the Byrne Group Plate Handicap Chase. “But we are absolutely thrilled. If he hadn’t made a mistake, you just don’t know. But he has run a blinder. “Hopefully we’ll find a race at Aintree for him, but it’s has got to be good ground,” she added. Mister McGoldrick, making his 85th racecourse appearance and his sixth at The Festival, ran a blinder. At the business end of the affairs for the entire race, the 13-year-old only flagged in the final few furlongs, finishing fourth at 33/1. “He does particularly love it round here and he never does run a bad race, does he, unless there’s something wrong,” said his trainer Sue Smith. “Throughout his life, he just gives you everything he’s got. He’s a super horse and I thought Jason [Maguire] gave him a superb ride today. At 13, it’s amazing. I wish I had as much energy as him,” she added. J P McManus, owner of the second-place horse Sunnyhillboy, was succinct. “I think we were beaten by a better horse, no ifs and no buts. It’s as simple as that,” he said.